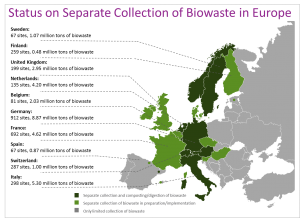 Large differences exist in the provision of separate collection and treatment capacity for bio-waste across Europe. Countries such as Austria, Switzerland, Germany, the Netherlands, Flanders (Belgium), Sweden and Norway, have relied upon separate bio-waste collection and treatment systems for over 15 years, whilst countries, such as the UK, Italy, Finland, Ireland, Slovenia, Estonia and France have made significant advances during this period. On the other hand, considerable potential for expansion remains in a number of countries such as Bulgaria, Greece, Croatia, Latvia, Lithuania, Malta, Poland, Portugal, Romania, Slovakia, Spain, Czech Republic, Hungary and Cyprus. In some instances, countries with established bio-waste collections rely predominantly upon composting green waste, leaving further potential for separate household food waste collections. Similarly, studies in regions where established separate bio-waste collections have been in place for many years, indicate that a high proportion of bio-waste (60-70 kg per inhabitant per year) remains within the residual waste stream [U.E.C. 2010]. Both therefore suggest further potential for expansion.